Accurate record keeping has become an essential part of farming in recent years. Regulation stipulates that accurate, up to date records be kept regarding every aspect of a product’s life cycle. This includes planting detail, growth stage dates, irrigation records and most importantly, spray records. It has become such a necessity that most farmers have had to change the way they previously kept records and adapt their methods in such a way to provide accurate information when needed. 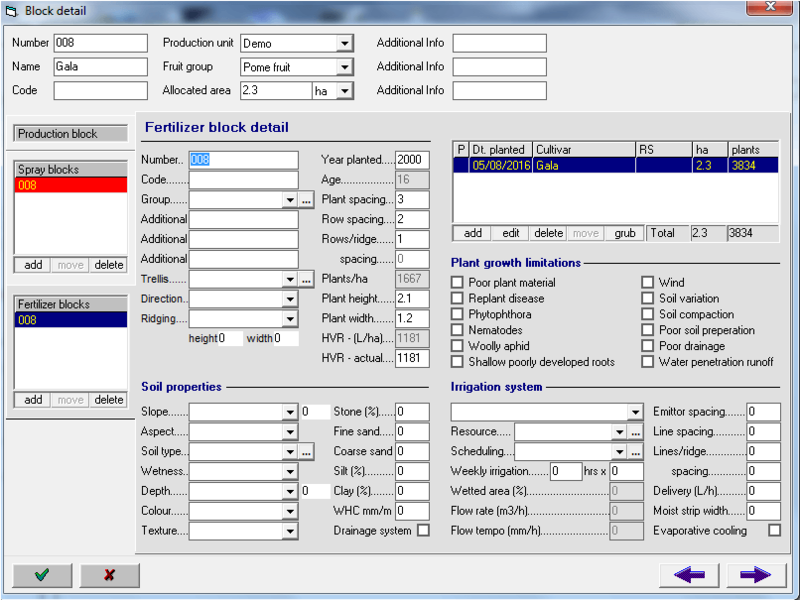 It is in this light that DFM Software Solutions developed the MB4000 Farm Management package. MB4000 provides the farmer with an easy-to-use record keeping system that can produce records and reports easily as needed. It allows the farmer to accurately record information ranging from stock records, spray records and even production records. Countrywide our clients are using this user-friendly program for record keeping as well as many other aspects of farming. MB4000 is compliant with GlobalGAP and Nature’s Choice and will be an invaluable tool during the auditing process. Record climate data and view graphs. Can be automated with Davis Weather Station or entered by hand. Record block planting detail, leaf and soil analysis and growth stage dates. Keep track of pest monitor readings and also physical shoot and fruit growth. Issue chemical application instructions in accordance to GlobalGAP and Nature's Choice standards, keeping accurate records. Record irrigation duration and volumes delivered. Record block activities and allocate cost. Full wage and salary solution enables the user to pay wages and/or salaries from an easy to use system. Can be linked to the DFM Activity Logger. Set up custom reports to be printed or exported.